It’s actually funny how I see a certain dish as a representative for a whole cuisine. When I say I want to eat Thai food I actually mean Red Thai Chicken Curry. When I talk about Italian food I actually mean pizza. And when I talk about Greek food I actually talk about Gyros and Tzatziki. Throw in a warm and garlicy pita bread and I am all yours. Okay I feel like a food racist now. Let me revise. Let’s talk about my personal Greek comfort food: Greek Chicken Gyros Sandwich with Tzatziki Sauce! It’s not a secret that I am drawn to everything that screams comfort food. If I ate what I crave all the time I’d probably be totally broke and I’d probably also have to buy new pants every other week. So making a lighter version of my favorites at home is not only an option but kind of a necessity. Next to that I am also chronically short in time not only due to my obsession with youtube but the fact that I have a full-time job, a long commute, a husband and if I feel social also a life. Spending long hours in the kitchen may be fun sometimes but as a chore on a weeknight it’s definitelly not. So I appreciate a satisfying meal that doesn’t take me too long to throw together AND has leftover lunch potential. 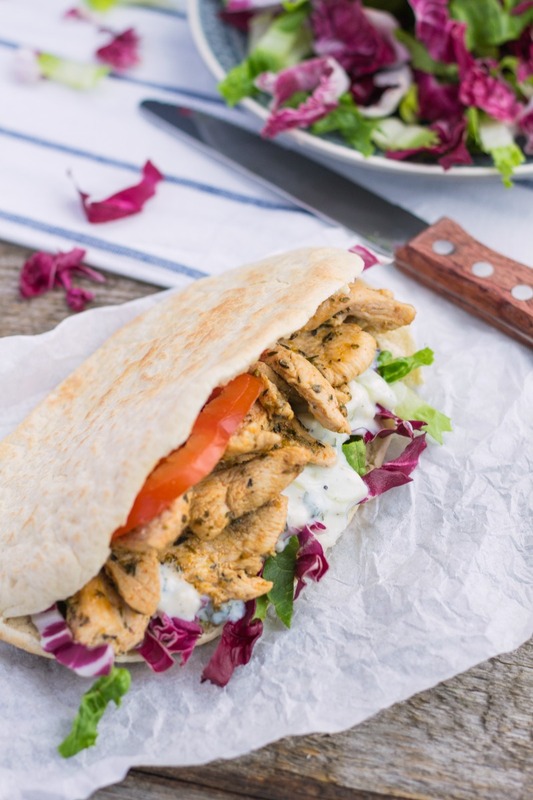 This Greek Chicken Gyros Sandwich with Tzatziki Sauce recipe definitely has me covered with everything I want and need. This Greek Chicken Gyros Sandwich with Tzatziki Sauce is a pefect meal for me. 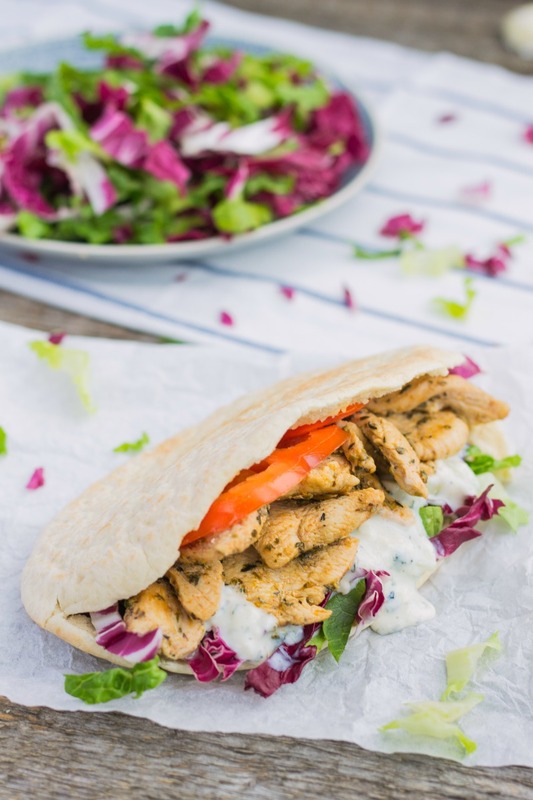 It has loads of protein thanks to the chicken and tzatziki sauce has good quality fats thanks to the olive oil and it’s also satisfying thanks to the carby pita bread. A winner on the macro front if you ask for my humble opinion. If you’re not that much into bread, no worries. Just add some more leafy greens and other vegetables and make it a salad. I’ve done that a couple of times and it tastes amazing! What I love especially about this dish is the flavors. 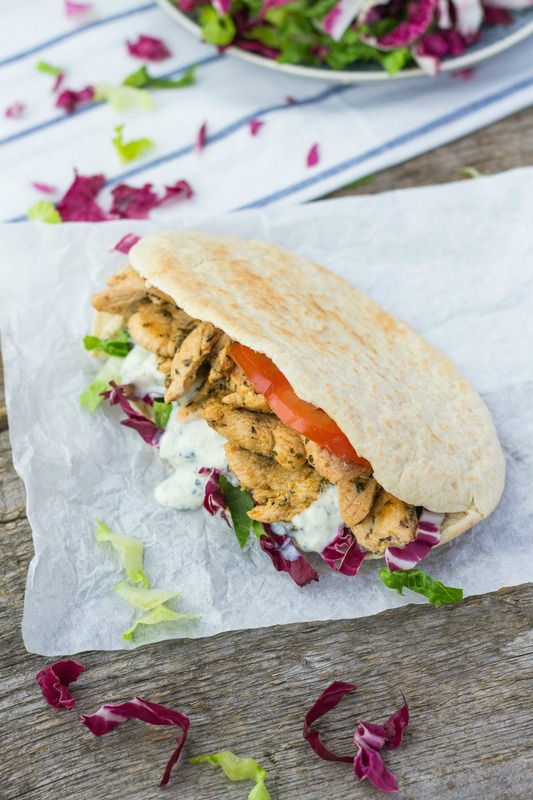 The gyros has just the right amount of spices and herbs and if I had to describe the taste of this Greek Chicken Gyros Sandwich with Tzatziki Sauce in one word I’d have to go with Mediterranean! So to me it basically tastes a bit like vacation. And we all know I am a sucker for anything that remotely reminds me of vacation. The tzatziki sauce is chock-full of flavor and predominatly garlicy. So if you’re not that much into garlic or have customer contact at work I’d suggest to decrease the amout of garlic or omit it altogether. But if you’re not afraid of a little garlic breath you will definitely be pleased with this sauce. Is it just me or do you have a ceratin dish that represents an entire cuisine to you? I love how easy this will be to whip together – and I have never made tzatziki before but I really enjoy eating it so this is another winner from you Juli. Next time I buy chicken to grill I will make this for sure. …. But I also think that any advancement on my knowledge of the varied cuisines of these countries stems from my own research – in the UK you are pretty much taught the above and no more. I mean the amount of people who asked me what else Americans eat, apart from burgers, fries, Oreos and PB& J sandwiches when I came back from there was insane! Oh gosh I always forget the Germany = Bratwurst thing. As I never eat it it’s just not on my radar haha. Really? That’s so interesting. I thougt that due to so many different cultural influences the thinking in the UK would be less stereotypical when it comes to different cuisines. Go north of London and the cultural influences become less and less… It’s really sad actually. And as a whole, Brits don’t really travel either so most of their experience of other countries comes from television. Hence all the stereotypes! I wasn’t aware of that but it totally makes sense. And north of London is pretty much the whole UK! A “food racist”! I love it, haha! For me American food is always burgers/fried chicken whilst Italian is pizza/pasta! Oh yes I see how lasagna can be a representative for Italian food.